Oh wow! She is super cute!! 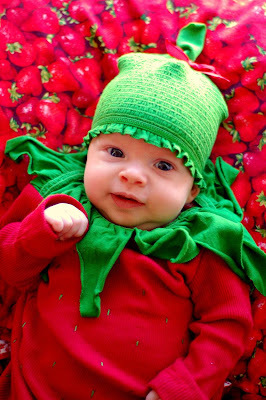 Love the strawberry outfit! I'd be distracted too if that had that adorable little baby in my house! Love the strawberry outfit! This is Auntie Queen B. I'm sure mommy has already told you I'm her biggest fan. You are one lucky strawberry... before you know it, you will have your own pink apron and you will be helping mommy in the kitchen, just like my baby strawberry. You picked a very good Mommy Strawberry. Yikes! That baby is freakin' adorable! Thanks for showing her off to us! Read thru' several posts. Everything looks delicious. So, so cute, Anne! Love the letter! Nice to meet you Baby Strawberry!! Now that is a cute baby! I would be distracted too if I was looking a that cuteness every day! Please buy me my own web address. I know! www.babystrawberry.com I'll bet he sell it cheap. Just ask him.